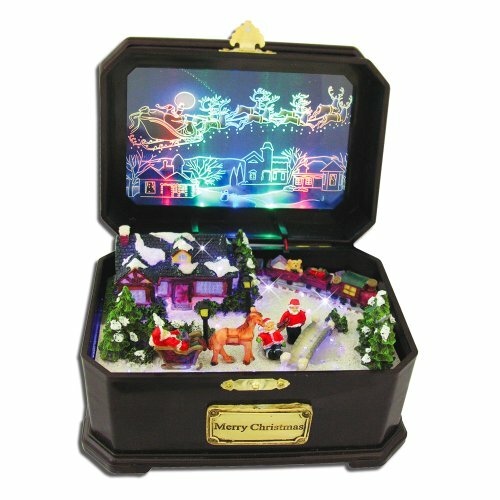 Holiday Music Box - Santa Clause Village. Open the lid and watch the twinkling fiber-optic lights pulsate to a melody of 8 traditional Christmas tunes. Sound activated. Music boxes are all 8"W x 5"H x 5.75"D. Requires 3 "AA" batteries (not included). Song List: 1. Jingle Bells; 2. We Wish You A Merry Christmas; 3. Silent Night; 4. Deck The Halls; 5. Joy To The World; 6. The First Noel; 7. Hark The Herald Angels Sing; 8. Oh Christmas Tree. New song will play when previous song is done by tapping on the side of the music box.